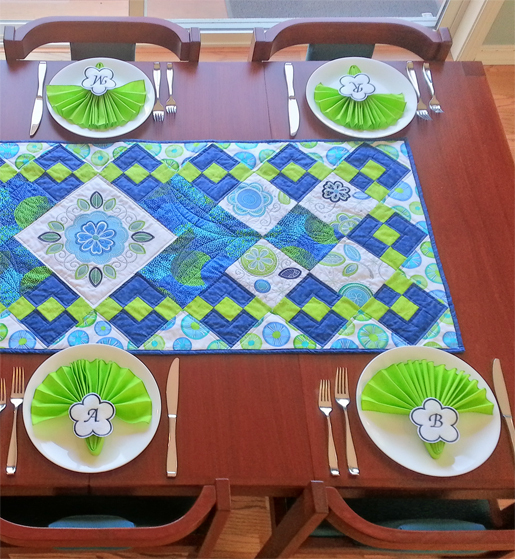 For Betty Stoltenburg‘s Sewapalooza samples she didn’t quite follow the instructions for the Ecco Table Topper. Her version is a long rectangle instead of a square! 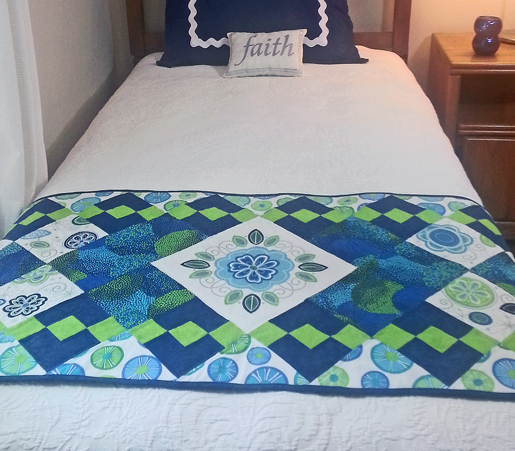 And it doubles nicely as a bed runner, too. For applique, follow the instructions included with the Ecco embroidery collection. 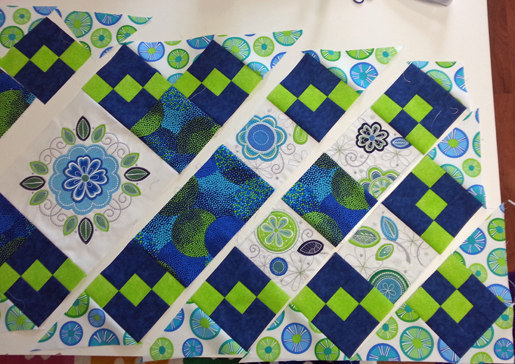 The only change I made was to use dark blue fabric instead of gray fabric for all nine applique blocks. For placement and tackdown stitches dark gray thread (#3644) was used instead of #0112 for this color change. Step 1) Prepare the applique fabrics. Apply Applique Fuse and Fix to the wrong side of the applique pieces. From the white fabric, cut one 15″ x 21″ rectangle and eight 6-1/2″” squares. Cut the applique pieces uisng your preferred method as described in the instructions included on the CD that came with your Ecco embroidery collection. Step 2) Make the Jumbo block. Use 505 adhesive spray to temporarily bond the large PolyMesh rectangle to the wrong side of the white rectangle. Hoop in the Jumbo Hoop. Load Ecco design #21012-14 onto your machine and select a basting box to stitch around the design area. Embroider the basting box and design. 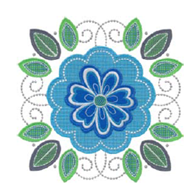 When complete, remove the embroidered fabric from the hoop and trim to 10-1/2″ square. Step 3) Make the small applique blocks. 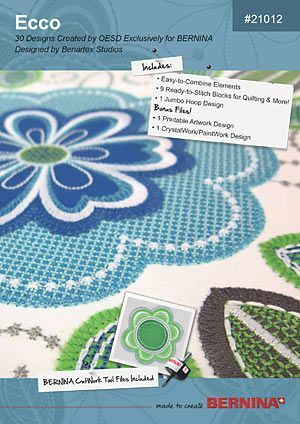 Pick eight small applique blocks from the Ecco design collection (designs #21012-15 through 23). Using the Large Oval Hoop, hoop one layer of PolyMesh stabilizer. Apply 505 adhesive and adhere one of the 6-1/2″ squares of fabric. Load and embroider one of the chosen designs. On the last color change, use either a white or light gray thread or omit completely. Remove the fabric from the hoop and trim to 5-1/2″ square. Repeat until all eight blocks are complete. Step 4) Cut the solid fabric blocks and triangles. Cut two 2-1/4″ squares. Sub-cut on the diagonal to create two (2) corner triangles per square for a total of four (4) half-square triangles. Step 5) Make Block A and Block B. With right sides together, sew one green strip between two blue strips. Press seam allowances towards the blue. Cut into eighteen (18) 2-3/16″-wide strips. With right sides together, sew one green strip to one wide blue strip. Press seam allowances toward the blue. Cut into thirty-six (36) 2-3/16″-wide strips. Block A – With right sides together, sew a Strip 2 to each side of a Strip 1, both outer strips running in the same direction.Repeat for a total of four (4) blocks. Square to 5-1/2″ squares if necessary. Block B – With right sides together, sew a Strip 2 to each side of a Strip 1, with outer strips running in opposite directions. Repeat for a total of fourteen (14) blocks. Square to 5-1/2″ squares if necessary. Step 6) Assemble the patchwork. 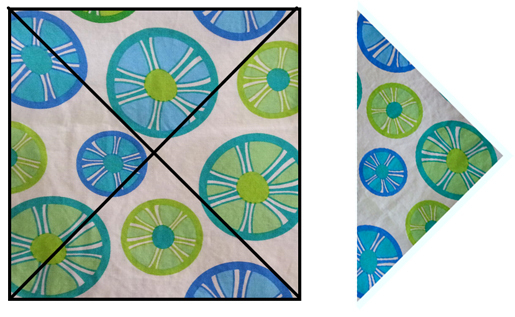 Stitch blocks together as shown to form diagonal rows, noting the direction of the green “lines.” Press seam allowances toward Block A or B. 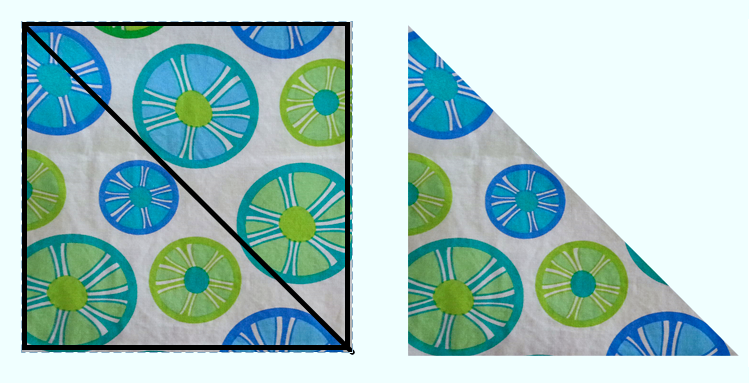 Rows 1 and 10: Add corner triangles after pressing seam allowances toward Block A. Center Medallion Row: Stitch short upper and lower rows 5 and 6. Stitch short upper and lower rows 5 and 6 together. 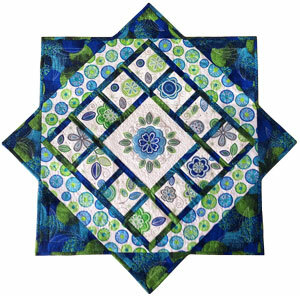 Sew medallion between short upper and lower row 5/6 pieces. Sew rows together to form complete quilt top. Press. Step 7) Complete the runner. Quilt and bind the runner using your favorite methods. 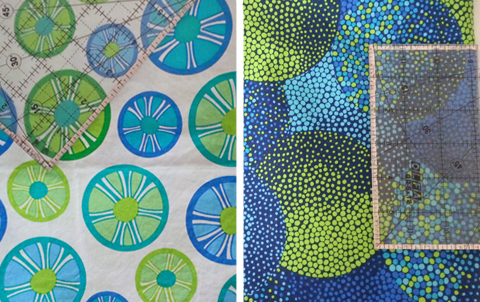 Tip: Make coordinating napkins from 15″ squares of fabric, finishing the edges with an overlocker/serger rolled hem. The napkin rings were digitized in BERNINA Embroidery Software 7 and DesignWorks Software. For the original square Ecco Table Topper Quilt instructions, designed by Linda Wenturine, visit www.bernina.com. Next Next post: Join the Fun During Our Back to School Pinterest Sweepstakes for a Chance to Win!